This jet boat adventure immerses you in the wilderness of the Alaska Chilkat Bald Eagle Preserve. 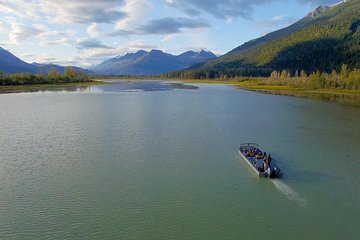 You’ll take a ferry ride to Haines for a small-group tour of town with a guide, followed by coach travel along the Haines Scenic Byway. Then set off through the braided tributaries of the Chilkat River. Wildlife opportunities abound with eagles and moose often being the highlights. Lunch and transport from Skagway included. Awesome trip. Saw 3 moose, one that crossed the river in front of us. Saw some bald eagles. Nature is never guaranteed, but it is a deliberate attempt to find and spend time with on this tour. Guide CP was great. Funny, thoughtful and knowledgable. Totally would do again. The boat transfer as part of this from Skagway to Haines was also very scenic and enjoyable.